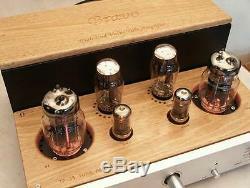 BRAVO 2.3 6C33 class A Integrated Tube Amplifier The music atmosphere is very good. Sound balance, rich levels and details Bravo 2.3 is an integrated valve amplifier of innovative design, having a singled-ended class A circuit handcrafted with point-to-point wiring for minimizing signal loss in transmission. This gear is fitted with Russian 6C33 vacuum tubes and direct heated rectifiers for deriving a power output of 15W per channel. Acclaimed as all-round in performance and is capable of delivering vivid, dynamic and rhythmical sound, giving listeners an impression of tonal balance in the entire frequency response. 2 separate chokes for regulating passage of alternate current at both high and low frequency with a view of suppressing background noise are deployed to ensure an awesome quiet sound stage. Overlaid with hand finished solid wooden boards that is engraved with the Bravo logo and other indications, an appearance of stylish and elegance is put in front of the audience. Made of aluminum alloy, the front panel of 16mm in thickness is also a representation of coherence in design of making the chassis robust and the gear working with durability. Review Summary: Sound The Bravo 2.3 nailed the midrange. It produced a sonic portrait densely packed with information and replete with the intense tonal color for which SET amps and integrateds are celebrated. But unlike some SET products, theres nothing wimpy about the Bravo 2.3; it was very dynamic and punchy, " displaying "sumptuous tonality that depicted instrumental and vocal sonorities with great detail and beauty.
" Features "Audio circuits dont get much simpler": "The signal enters, goes through a single tube that serves as gain stage and driver stage, then enters the output stage. " "The Bravo 2.3 uses two huge 6C33 triode tubes in a single-ended-output configuration to produce a claimed 18Wpc" along with "two 6J4P driver tubes and two 5A4 rectifiers (although 5Z3P rectifiers were specified). The use of a separate rectifier tube for each channel means plenty of current will be available.
" Use "In use, the Bravo 2.3 displayed a few quirks. It produced a distinctive odor -- not unpleasant, but when I walked into the room where the amplifier was located, I could smell an odor of electronic equipment. Also, this integrated got rather hot to the touch. " "I might wish the remote control had a little more flexibility, but volume control is the only really essential remote function, and the Bravo 2.3s tiny remote performed that operation flawlessly.
" Value "If I say the Bravo 2.3 achieved 90% of the PX-25/LS26s sound for 15% of its cost, that should be doggone amazing. Specifications: Output Power: 15W X 2 Total Harmonic Distortion: 1% (8W) S/N ratio : 88dB Frequency Response: 10Hz-42KHz (-3dB) Input Sensitivity: 0. 6V for 14W Input Impedance: 47K Vacuum Tube: 6C33 x2 5Z3P X2 6J4P X2 Static Power Consumption: 240W Dimensions: 430 (W) ×170 (H) ×335 (D) Net Weight: 23Kgs Gross Weight 25 Kg Dimensions 540(W) x 330(H) x 460(D) Packing Dimensions 430(W) x 170(H) x 335(D) After ordering, need 2 weeks to make it. The item "BRAVO 2.3 6C33 class A Integrated Tube Amplifier" is in sale since Friday, September 29, 2017. This item is in the category "Consumer Electronics\TV, Video & Home Audio\Home Audio\Receivers & Amplifiers\Amplifiers & Preamps". The seller is "lance6881888" and is located in Shenzhen, Guangdong. This item can be shipped worldwide.